Happy Quilting: The Ultimate Guide to Machine Quilting!!!! 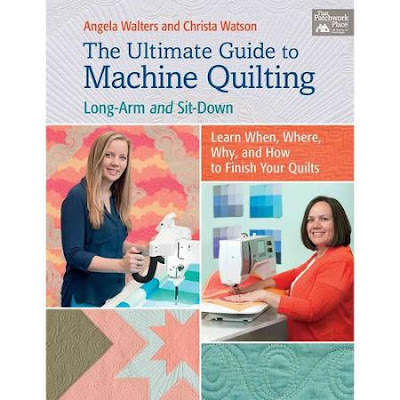 Today I am very excited to share with you The Ultimate Guide to Machine Quilting by two of my amazing quilting friends, Angela Walters and Christa Watson!!!! I met Angela at my first Quilt Market when I won a copy of her book and we became fast friends ;) She was part of my Celebrate Mom's event and shared all about how she maintains her thriving business (did you know she opened a brick and mortar store as well!!) while still being an amazing mom! And Angela and I super bonded when there was a little mix-up at a schoolhouse we were participating in and we found found we were it. Super funny story!!! Angela is an amazing Long-Arm Quilter, Fabric Designer, Author, Business Owner, Quilter, and above all Friend!!!! Christa and I met like most of us quilters do, on-line but we really got to know each other when we were able to have lunch before I flew out of Vegas on my way to Market. We did not stop talking for 3 hours straight. We got to discuss our first books that we were both working on proposing and it was just fabulous to know I had a friend jumping into the deep end of the pool with me ;) Later that year Christa stopped by my home on her way to Sewing Summit, and once again, we chatted non-stop quilting goodness. And just like Angela, Christa is an amazing Friend, Author, Business Owner, Quilter, and Sit, Down Quilter. Can you see why they make such a Dynamic Duo!!! Their amazing book, The Ultimate Guide to Machine Quilting , arrived at my house a few days ago and it has already become a favorite!!! I have flipped through it again and again and I will tell you why . . . Because of course, like all quilting books, it shows you lots of amazing quilting eye candy and how to do it, which I just love . . . but then, it takes it so much farther!!! Let me use an example to show you what I mean. But then is my favorite part of the book. Wonderful Advice from Angela and Christa. For this quilt, Plumb Lines, Angela focuses on straight line quilting on a long-arm and shares lots of amazing insights on quilting on a long-arm with a ruler. For someone who is just conquering her fear of rulers, this was amazing!!! She actually goes over how she holds the ruler. Just so awesome!!! And then, Christa shares her advice for quilting her version of Plumb Lines. Christa focuses on using Modern Quilting stitches other than straight lines. She shares great advice on how to divide up the quilts so the overall design isn't so intimidating and goes over the sequence of the order she quilts it in to make it easiest on a sit-down machine. Brilliant!!! 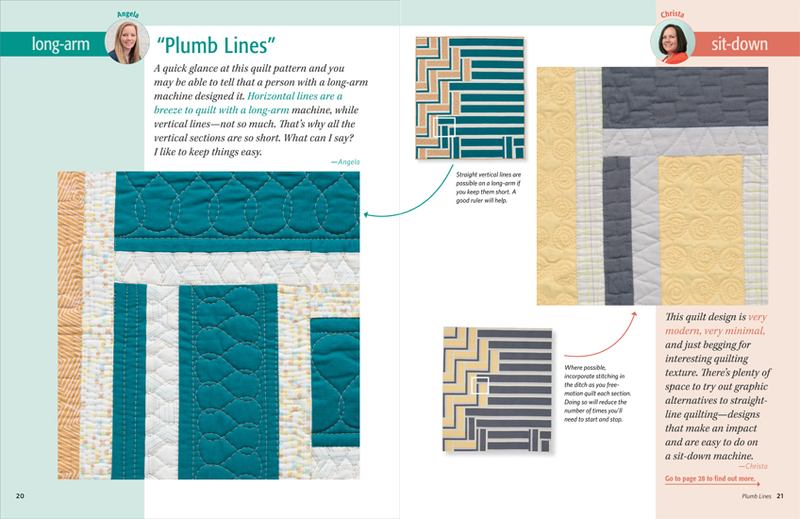 And with each new quilt design in the book, Angela and Christa share lots more wonderful advice on not just how to quilt a quilting design, but like it says on the cover, When, Where, Why, and How to Finish Your Quilts!!! It really is like you are sitting next to Angela or Christa and being able to pick their minds on why they make each quilting decision. 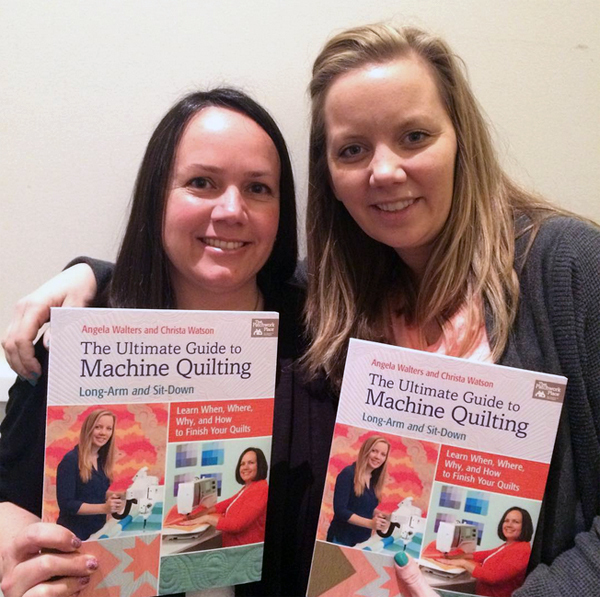 What an amazing recourse and truly it is, The Ultimate Guide to Machine Quilting !!! Huge congrats to both Angela and Christa on such a fantastic book!!! Way to go friends!!! Dear Melissa, I have this book on my Amazon Wishlist. I hope to get it one day. You are so beautiful. I love these photos. Thanks for sharing this book. Love this book! I got an advance copy of it (my review will be published on Monday) and I've already put into practice some of the suggested tips and techniques! I bought a signed copy of their book and love it too Melissa! I'm going to attempt to quilt "Swirling Butterflies" today and tomorrow and hopefully have it done in time for my own review of The Ultimate Guide on Monday. I loved reading about how the three of you just hit it off to completely and are friends! My April Must Finish is a graduation quilt for my oldest grandson!